but for a few brief weeks in late winter to early spring, when there is little to enjoy in the garden, it bursts into brilliance as the brightly colored flowers emerge from the leafless stems. The flowers are followed by 2" round, yellow, edible fruit. on the previous years growth in early January. In northern zones, the flowering may not begin until late February or early March. Flowering will be heavier in regions that experience at least 8 weeks of winter cold. hardy in USDA Zones 4-9 where it will grow from 5-10 ft. in height and width. Quince is easy to grow in almost any soil, as long as it is well drained and not overly-fertile. They will tolerate a wide range of soil pH from slightly alkaline to acidic. 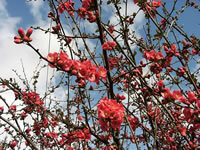 Flowering Quince can be grown in full sun or partial shade. Once established, Quince is a very drought tolerant plant. The spreading form and spiny branches make this plant an excellent choice for hedges, screening, or as a security barrier. The hybrid Flowering Quince, Chaenomeles x superba, is a cross between C. speciosa and C. japonica that includes more flower colors and shapes, as well as several lower growing varieties. To produce vigorous new growth and improve the shape of your Flowering Quince, remove some of the oldest stems each year in the spring, keeping in mind that the flowers are produced on the previous years growth. Flowering Quince can be propagated by softwood cuttings taken in early summer. By the end of the winter, most gardeners are longing to see a few fresh flowers. 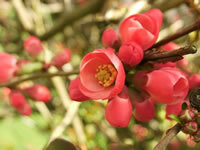 Branches can be cut from your Flowering Quince in late winter and forced to bloom indoors. The best branches for forcing are those near the top of the plant, with closely spaced flower buds. The larger the buds, the more quickly they'll open indoors. 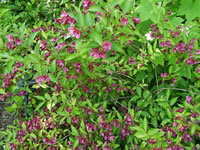 Trim any buds and side branches from the area of the stem that will be submerged in the water. Recut the stems at a long slant and place them in a vase of cold water in a cool place for two days. Recut the stem again and move it into a vase of warm, fresh water. Set the vase in a bright area and in about four weeks, you will have a beautiful red bouquet to brighten your day.